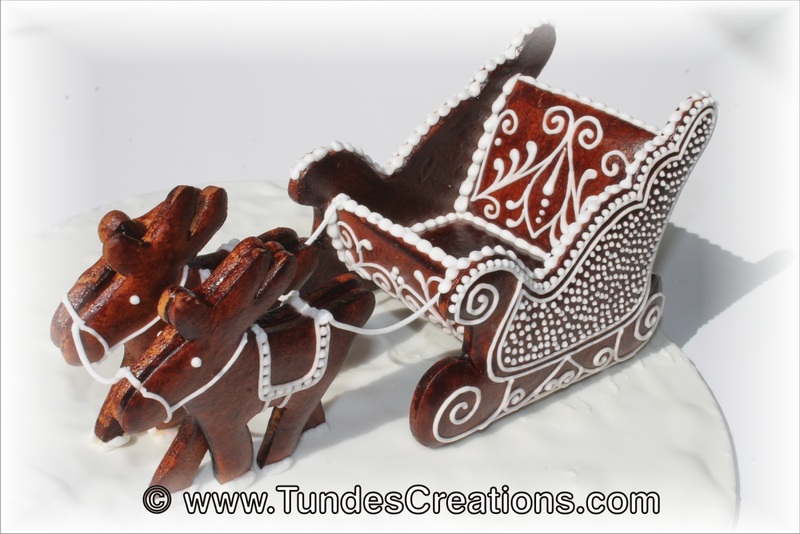 I love 3D creations and always wanted to create a Santa's Sleigh. I designed a cutter set and Cookie Cutter Kingdom created it for me. Did you know, that they have a great custom order tool now? If you have a jpg picture of the shape you need, then your cutter is just a few clicks away. I love this tool. First I baked all the pieces (using the recipe of the 3D hearts): 2 sides, bottom, back, front and the 2+2 reindeer. 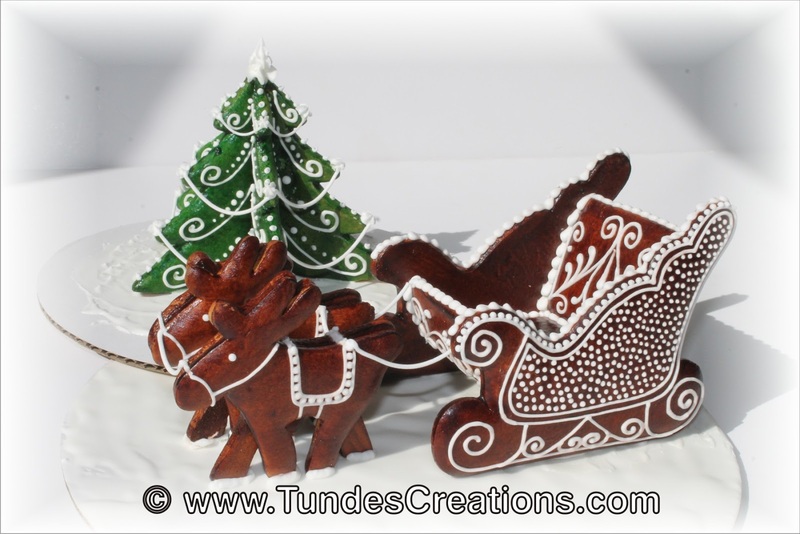 Used brown egg yolk glaze to color (see recipe at 3D hearts) all pieces and decorated the pieces using royal icing. I glued together the open legged reindeer with his closed legged buddy. Now he has 4 legs. This way it will be easier to stand him up. Then I laid one side of the sleigh down and glued the bottom and the back to it. I added the front panel. Finally glued the other side on top. My icing dries pretty fast, after 30 minutes I could work on it. I used bead border to hide the glue and to decorate the top. I coated a cake board with a layer of icing for base and glued the parts on top. When it dried, I added a few icing lines to connect the deer with the sleigh and each other. I hope you like this project! If you make it, please send me a picture. 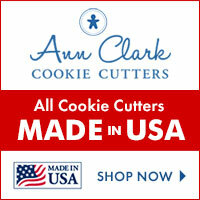 If you need the cutters, find them at Cookie Cutter Kingdom. Hi Tunde! I love the look/appearance of your design. As always, you never cease to amaze and are flawless. I'm going to look at cookie cutter kingdom (again!) lol; I get distracted and forget to go back. I like this sleigh set. I don't like the cuttr I have and a template sleigh that I cut out seems too big. I've been thinking of using it though and trying to decorate it. Love ya!